Mix the cheese, eggs and maida and beat to a fluffy batter. Add hara dhania, tomato, capsicum, salt and baking powder and mix well. Rest in a cool place about 15 minutes. Cut the bread slices into halves, diagonally (to get triangles). Toast the bread pieces on one side. 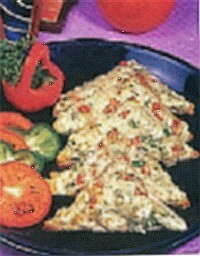 Put a layer of cheese mixture over the un-toasted side of the bread, brown under a grill and serve.